The 2018/19 season is done but 50/50 funding in support of local athletes carries on. Updated Friday March 29, 2019 by Kitchener Sports Association. 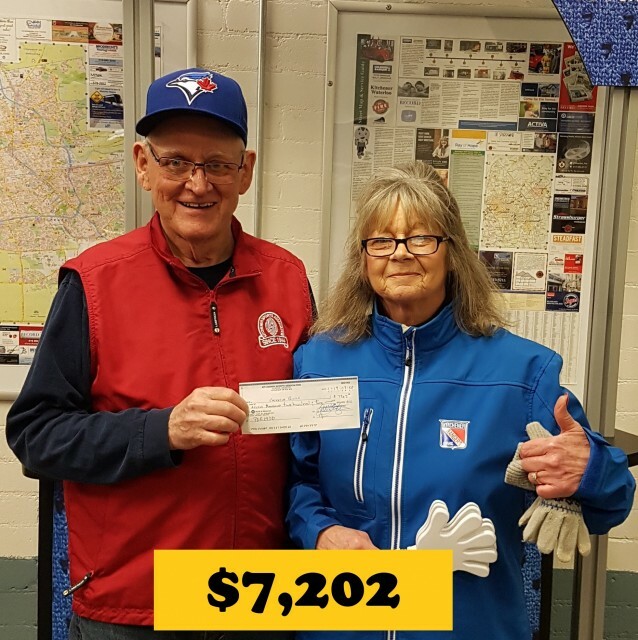 Last game of the Rangers 2018/19 season: On March 28, Catherine Pringle left the Aud with the 50/50 prize, $7,202, presented by KSA's Rick Waud. (Photo by Lynn Chapman.) It was a great year for local minor sports groups as fans at the Rangers games supported them through the purchase of KSA 50/50 tickets in record numbers. The final regular-season game (on March 15) featured a season-high draw for $24,005 (won by Ray St. Croix) and Jonathan Yantsis's 4-goal performance that got him to the 50-goal plateau. Yantsis became the first Ranger to score 50 since Jeff Skinner and only 15th player in team history! Congratulations Jonathan! And, congratulations Catherine, Ray and all the other 50/50 winners we met this season. Have a great summer ... and please come back next year! Specifics on our 50/50 draws effective for the 2018/19 are the same as for last season. Purchasers must be 18 years of age (or older). The draw is being run utilizing electronic terminals and updated "live" pot tabulations.Ticket prices for this season are $5 (3 entries), $10 (10 entries), or $20 (50 entries). Each purchase includes a selection of computer-generated numbers. Tickets are sold before each Rangers home game until just before the end of the second intermission. The winning number will be drawn during the early part of the third period and announced through the public address system at the Kitchener Auditorium as soon thereafter as time and play permit. The prize can be claimed until the end of the game at the Boston Pizza Fan Servives Office (behind section #3 on the main course) by the East Avenue entrance. The prize may be claimed up to 6 months following the draw. Thanks Rangers! Thanks fans! Local athletes! Photos of some of last year's 50/50 draw winners. If you have a winning ticket you can claim your prize during the game at the location announced -- or within 6 months thereafter, but why wait? Please ask for assistance if uncertain where to claim your prize -- the Boston Pizza Fan Services Office behind section #3 -- or how best to get there. You must be at least 18 years old, have the actual stub, and submit it, to claim the prize. In case of clerical error, the official number(s) as announced at the Rangers game are the only one(s) for which prize(s) will be awarded. This listing is historical. In compliance with regulations and in an effort to ensure that each prize is claimed, specific claiming procedures must be followed as announced and/or posted at each specific event. Please claim the prize as soon as possible!